Summary of the project: I spent a month working for the Kasiisi Project in rural Western Uganda, developing a business and communications strategy to help the project become self-sustainable. 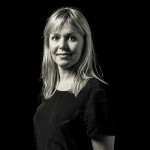 Hanne joined W+K London in the summer of 2009, working on a number of global campaigns for Nokia. Since then, she’s moved on to the world of dairy and gum - managing the Cravendale Milk and Stride Gum accounts. In 2011, she worked on the Cats with Thumbs campaign for Cravendale and more recently, Gumulon, an iPhone game for Stride that’s controlled by chewing. She has also dabbled in various interactive projects, such as OFF/ON – W+K London’s own energy saving initiative – and the Kaiser Chiefs album launch. Prior to W+K, Hanne worked at DLKW and Euro RSCG London, looking after Morrisons, Three and Peugeot. When not account handling, she likes to cook, practice pilates, dream of owning a dog and exploring London and its pubs. She’s also an avid traveller, and has spent a lot of time in Central and South America through the years. Hanne is excited to be chosen for TIE and for the opportunity to live and work in a completely different environment. You can read more about her project here.